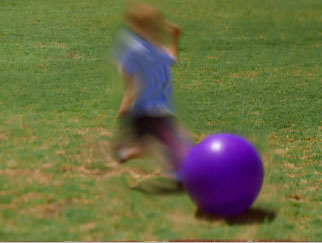 The BCC Motion Blur ﬁlter creates a realistic blur on the motion in an image, simulating the effect of shooting a moving object on ﬁlm. The blur is based on the motion of the pixels in the image. For example, you could apply the Motion Blur ﬁlter to a clip of a speeding car and the car’s motion would blur while the background would not. The blur is most pronounced when the object moves quickly and more subtle when it moves slowly. Motion blur is not visible if the image is static. Based upon optical ﬂow technology, this ﬁlter examines past and future frames to determine the motion of the pixels in the image. 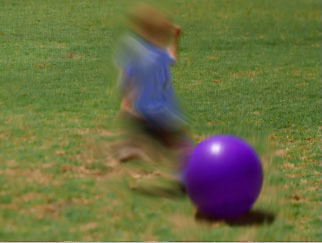 Depending upon the selected settings, a blur or a smear is applied to the pixels that move from one frame to the next. You can use an image in the timeline as a source for motion and then apply the motion from the chosen image to the ﬁltered track. BCC10 introduces a new Advanced optical flow option – accessed via the Optical Flow Method menu. This Advanced mode uses OpenCL hardware assisted rendering to implement a more sophisticated (and more computationally intensive) motion vector analysis. The performance of the Advance mode varies widely from one graphics card to another and if you see reduced performance or unexpected results when using the Advanced option it is recommended that you switch to the Simple mode on that card. The Source Layer menu sets the media to blur with the source layer (the clip or track to which the ﬁlter is applied). You must assign the media that you want to use to the Source Layer menu. When this menu is set to None, the other parameters have no affect. 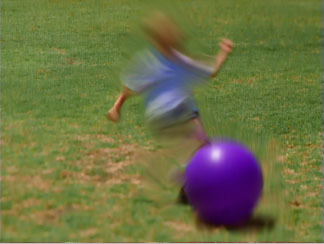 Motion Blur Amt sets the amount of blur or smear that is applied to moving pixels. Positive values apply the blur or smear; negative values sharpen these pixels. The following example shows Blur as the Blur Type. Smear Falloff determines the falloff when the Blur Type menu is set to Smear. Falloff is the transition between the smeared and unsmeared areas. At a value of 0, the Smear is fully applied; at a value of 100, the smear has no affect. This is ideal for animating the smear. Velocity Limit determines the range of moving pixels that are ﬁltered. At a value of 0, the ﬁlter will not ﬁnd any moving pixels in the image; at a value of 1000 (maximum), the ﬁlter uses the full range of motion in the image. The Optical Flow Method menu chooses between the original Simple optical flow method and a newer Advanced mode. The Advanced mode uses OpenCL hardware assisted rendering to implement a more sophisticated (and more computationally intensive) motion vector analysis. The performance of the Advance mode varies widely from one graphics card to another and if you see reduced performance or unexpected results when using the Advanced option it is recommended that you switch to the Simple mode on that card. The controls in the Advanced group are only relevant when the Optical Flow Method is set to Advanced. The controls in this group are used to fine tune the motion analysis performed by the Advanced mode. Motion vector analysis tends to be highly dependent on the details of each individual clip, and these controls are used to optimize the quality and performance results on a per-clip basis. The Better Downsampling checkbox turns on a higher quality downsampling mode which can increase the accuracy of the motion vector analysis when the Optical Flow Resolution is set to a value below Best. Enabling the Better Downsampling mode does slightly increase render times however. The Optical Flow Resolution menu controls the downsampling used during the motion vector analysis. Choosing Best will generate the highest quality motion vectors but will also increase render times, whereas High and Medium will do motion analysis at reduced resolution but with progressively faster performance. The Motion Complexity slider is used to fine tune the motion vector analysis based on the type of motion in the clip. For clips with very complex motion – elements moving in many different directions – you can more accurately capture those motion intricacies by increasing the Motion Complexity slider. 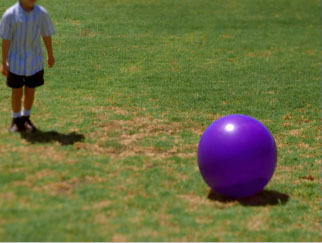 However as the Motion Complexity slider increases the motion vector field tends to be less uniform which can cause unwanted discontinuities in the motion blur result for images which don’t contain a lot of complex motion. This slider should be tweaked to find the right balance between blur uniformity and motion detail for your particular image. The Image Detail slider is used to fine tune the motion vector analysis based on how much fine detail the clip contains. Increasing the Image Detail slider causes the motion to be analyzed at finer and finer levels of detail which can increase accuracy in images with lots of detail but which can also reduce performance. The Accuracy Tuning menu is used to provide another level of trade of between accuracy and performance. Higher values will generate more detailed and accurate vector maps but at the cost of increasing render intensiveness. The Motion Post-Smoothing menu controls whether or not the motion vector field is smoothed after being created which can yield more uniform looking results in cases where the vectors have excessive variation. When set to None there is no post-smoothing of the motion vectors, whereas choosing Small or Large will apply increasing amounts of smoothing to the vector field. The FG Mask Layer menu sets the media to use as a foreground mask to constrain the pixel movement. When this menu is set to None, the media that is assigned to the FG Mask Layer has no affect. The FG Mask Channel menu determines which channel is used to create the foreground mask. The choices are Red, Green, Blue, Luma or Alpha. This setting has no affect if you have assigned the FG Mask Layer menu set to None. The FG Blur Type menu sets the type of motion blur that is created on the foreground mask. The choices are Blur or Smear. Smear blurs the pixels in one direction; Blur blurs the pixels symmetrically. This option is applied to the foreground calculation; the background image is controlled by the Blur Type menu. This setting has no affect if the FG Mask Layer menu is set to None. FG Motion Blur Amount sets the amount of blur or smear applied to moving pixels in the foreground image. Positive values apply the blur or smear; negative values sharpen pixels. FG Smear Falloff determines the falloff when the FG Blur Type menu is set to Smear. Falloff is the transition between the smeared and unsmeared areas.At a value of 0, the Smear is fully applied; at a value of 100, the smear has no affect on the image. This is ideal for animating the smear. FG Velocity Limit determines the range of moving pixels in the foreground image that are ﬁltered. At a value of 0, the ﬁlter will not ﬁnd any moving pixels in the image; at a value of 2000 (maximum), the ﬁlter uses the full range of motion in the image.